Music Kids Toys give your child an artistic outlet for their musical talents. Our large selection of Music Kids gives you a variety of musical instruments including drums, cymbals, flutes, recorders, harmonicas and keyboards you can buy for your child. We have traditional wooden instruments as well as lifelike plastic replicas of familiar favourites. If your child likes to sing, we have Stand Up Microphones to carry their voice across the room. Our Rock Electronic Guitar lets them channel their inner rock star. 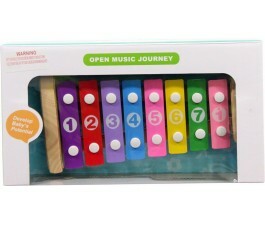 Music Kids Toys help your child learn rhythm and find their inner artistic voice. Shop online today and let Mr Toys deliver your child's band instruments to your home.